Leave a Comment on My HUGE Anxiety Breakthroughs And How They​ Can Help You Too! Wow, I’m not going to lie, this process has not been easy. In fact, I think it’s been the hardest part of my journey so far. Yes, harder than actually becoming migraine free! Crazy, I know. Before I go on, I first need to apologise for the recent radio silence. Going through Cognitive Behavioural Therapy and working on trying to master my mind and my thoughts has literally taken up every hour of every day. It really has been a battle but I know in order to break through this, all my energy and focus needed to go into it so that’s what I’ve been working on these past few weeks. So let’s cut to the chase. What are my breakthroughs? 1. I CAN GET RID OF PHYSICAL PAIN! Yes, this actually happened. After a week of a debilitating headache and eye pain and so much time spent indoors resting, I woke up one morning and said enough was enough. I sat down with my ‘thought monitor’ (which is a CBT process whereby you reduce your anxiety by through creating new positive beliefs) and filled in the worksheet in order to reduce my anxiety. This is a signal to start to roll my shoulders and breath deep because this will pass. I am in control, no one else. I am stronger than that and I KNOW I can do it. I have BEATEN the migraines so I can BEAT this too. I am doing it NOW!!! And as I did something miraculous happened. Not only did my anxiety start to disappear but so did the eye pain and headache! After around 45 minutes of repeating this over and over and over whilst taking in deep breaths and rolling my shoulders, everything vanished! What on earth had I just done? I had taught myself that by completely eliminating my anxiety I can also eliminate my headache and pain! This was a revelation and it taught me that I am in the driver’s seat of my body and how I feel. This was a major breakthrough for me. 2. I CAN REDUCE MY ANXIETY BY SIMPLY SAYING NO! So after my fifth CBT session, I started to become frustrated. I could use the ‘thought monitor’ effectively and get rid of my anxiety at that moment, however, when I ventured out into the world again it wasn’t long before those destructive thoughts would enter my mind and cause me havoc. I raised this problem in one of my sessions and my therapist advised me to simply say to myself when that thought comes up “I am simply not going to go there”. Then after that bring yourself back to the present moment and distract yourself with what’s happening in the now. It sounds so simple but oh my god it works amazingly! Then after discussing this with my amazing boss and mentor Anthony Cocco, who is six years migraines free, he elaborated on this and best described this process as a simple game of tennis. All you have to do is bat the thought away with your tennis racket as if the thought were a ball. Genius! I now even visualize this too. So since combining these two steps, everything has changed. Seriously, no joke. I suddenly have a new-found confidence as my anxiety is no longer holding me back and I’m now free to experience the joys of life again without having the chains of anxiety ruining my every move. I no longer find myself getting stuck in the moment, full of worry and doubt, unable to move, and instead I pause, take action and am able to carry on with the rest of my day. I guess like with anything in life, this of course is going to take a lot more practice, time and patience to perfect this skill and become a master of it on the court, however, it’s without a doubt worth the hard work. 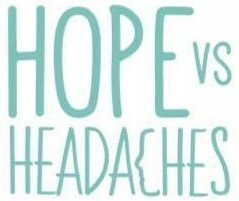 Next Entry Chronic Migraines To 1 Year Migraine Free – How Did I Do It?